“By an ancient ridgeway that passes through the Uffington White Horse, Oxfordshire, a Neolithic long barrow constructed at least 5,ooo years ago stands amid a circle of trees. 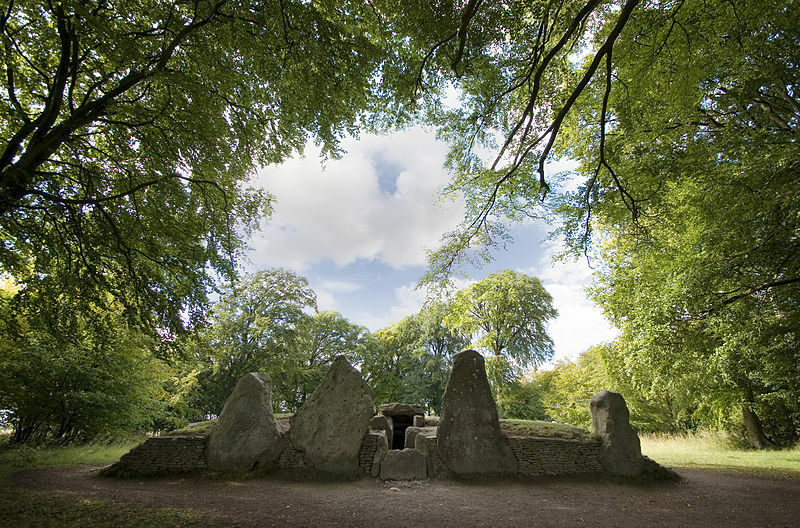 The barrow with its large entry stones is known as Wayland’s Smithy, taking its name from the Teutonic demi-god, Weyland the Smith, also called Volund, for the first Saxons to see the mound thought it had been constructed by a god or giant”. “According to legend, anyone who passed this barrow with a horse that needed shoeing need only leave a silver coin then retreat; on his return, the coin would be gone and the horse shod. Similar tales are to be found in ancient Greek mythology concerning the classical smith god, Vulcan”. Wayland Smithy Long Barrow entrance (photo credit: Msemmett for Wikipedia). “Because the ‘smithy’ lay on the boundary of two Saxon estates it is the only ancient monument to be named on an Anglo-Saxon charter; dating to before the Norman Conquest, the conveyance charter referrs to the barrow as ‘Welandes Smiththan'”. “Teutonic beliefs brought here by the invading Saxons during the 5th century inform us that Weland was the youngest of three sons fathered by the demi-god Wade. 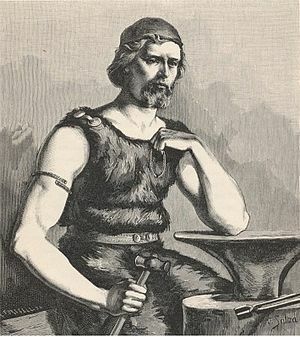 As a child Weland was entrusted into the hands of dwarves who lived amid the metals in the mountains and taught him the magical art of the smith, thus he became skilled in forging, making weapons and jewellery”. “In his Iceland homeland Weyland spent much of his time out hunting with his two brothers. The three finally settled in a place called Ulfda where, one day, they saw three beautiful Valkyrier (nymphs) swimming naked in a lake, their ‘elf garments’ left lying on the shore. The brothers seized the magical clothes and the women who they took to be their wives”. “All lived contentedly together for eight years, then the Valkyrier became bored with domesticity and one day fled with the brothers were out hunting . Discovering their loss, two of the brothers went in pursuit, leaving Weland behind tending his forge. Anticipating the wives’ return, Weland wrought three golden rings which he strung on a willow wand”. “One day, while Weland was out hunting, King Niduth of Sweden who was searching for a smith entered Weland’s empty hut, saw the golden rings and took one for his daughter, Baudvild. Weland returned that night and, while roasting a piece of bear meat, noticed that one of the rings was missing. This caused him great joy as he imagined that his wife had returned, so sat awaiting her arrival and soon feel asleep”. “But instead of his wife, King Niduth returned, had Weland seized and carried to the palace. Then, by the Queen’s command, Weland was hamstrung, placed on a small island and compelled to work for his royal couple. Not surprisingly, Weland sought revenge and a suitable opportunity soon arose”. “King Niduth’s two greedy sons approached Weland demanding to see the tresure and were told it was kept at his forge (Wayland’s Smithy, Oxfordshire, was probably raided for treasure early in its history). Having seen the treasure, Weland told the brothers that if they returned the following morning he would give it to them”. “So they returned the next day and as they entered Weland slammed the door shut, decapitated them with one blow and buried their bodies. But the skulls he fashioned into silver-plated goblets for the King’s table; from their eyes he produced gems for the Queen; and the princess received a pearl necklace made from their teeth. Weland took further revenge on the princess who he raped when she came to him secretly to have repaired the golden ring given her by her father. As a result of this unwilling union a daughter was born who would herself become part of a later Teutonic mythology”. “Weland then escaped his island prison by taking flight, using a pair of magical wings he had wrought in metal. He landed on the palace wall, called the King and Queen forth and told them of the terrible fate of their two sons and the violation of their daughter. His revenge complete, Weland took to the air and was never seen on Earth again”. “His new role, apparently, was to act as armourer to the gods and our ancestors believed that Weland kept a doorway open into their world at Wayland’s Smithy; certainly there is some evidence of worship at this site”. McGrory, David., ‘Weyland The Smith’ (article in Prediction magazine), June 1995 Volume 61 Number 6, Croydon, Surrey. Categories: Misc Subjects, Myths And Legends | Tags: Weyland The Smith - An Article by David McGrory | Permalink.